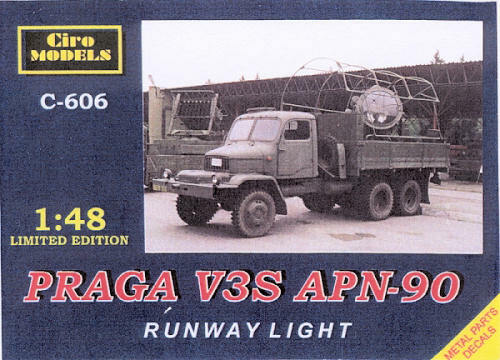 The military truck V3S (Vojensky 3 tunovy Special / Military 3 ton Special) was developed in Praga factory in early fifties. The construction was intended for heavy working load in heavy terrain. 3 powered axle rods with doubled rear wheals, low weight, 8 drive gear, high chassis clearance guarantied excellent terrain performance (grad ability is up to 75%). It can be loaded with 3300 kg in heavy terrain. On the other hand the used construction limits the speed to 60 km/h. The service started in 1953 and the modifications (these were very light) are still in use. The army used various versions, from personal truck, rocket launcher platform, AA gun platform, airfield electric power unit, pressure air unit, AA light platform etc. The road version is named S5T (silnicni 5 tunovy – road 5 ton). As in the case of V3S during the years have existed plenty of versions like fire truck, crank platform, dump truck. The truck is true legend of the Czechoslovak roads. In quite sturdy box you get few polythene bags with altogether 50 resin and 49 PE parts. There are some pieces the modeler has to scratch build, the most difficult (to my opinion) is the lens for the reflector. 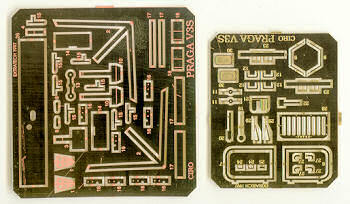 Other scratch building is limited to various tubes and rods. Some parts have little bit of flash to be cleaned and there are few bubbles in the casting but nothing that would not be possible to overcome. The detail is decent regarding the age of the kit – 1997. There are following versions available: platform truck, pressure air truck, power unit truck, runway light truck, box truck. The re is small decal sheet apparently common for other version of the truck produced by CIRO. 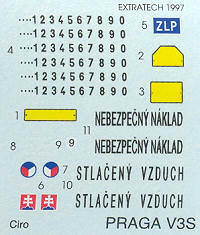 It contain Czech and Slovak insignias, “Dangerous load” and “Pressured air” signs and three sets of number for plates. The instruction sheet is nicely done, with clear diagrams and colour guide for Humbrol, Revell and Agama paints. Somewhat limited kit, as only Czechoslovak, or Czech and Slovak army used this vehicle. I believe there can be found some camouflages for UN trucks too. 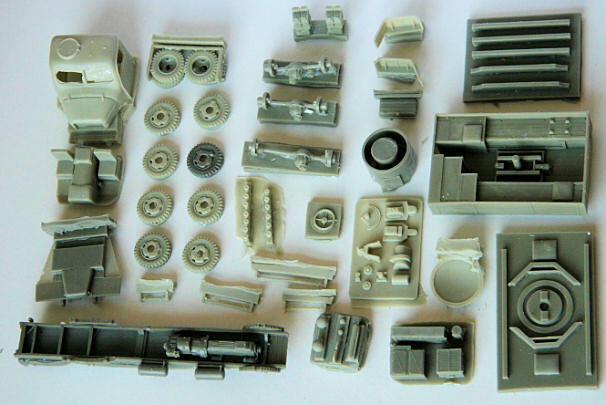 As the kits are focused on airfield used versions, it can add nice touch to some Eastern block diorama and, with regard of the service time, using wide range of aircraft.